You’ve probably heard the term pent-up demand bantered about over the years. Pent-up demand is a term used in business to describe consumers who have held off purchases, bolstering savings accounts in uncertain economic times, and waiting for consumer confidence to increase before unleashing purchasing power. We’ve certainly seen pent-up demand unleashed in the last 12 months as the 4th qtr of 2008 was nearly an all-time record in home sales in SW Florida, and the 1st and 2nd quarters of 2009 have been all-time sales records. We talked extensively how 1st time home buyers and investors have driven sales to record levels, but one thing that has been lacking is upward pricing pressure that usually accompanies a downward trend in inventory levels. In order to assess what future pricing trends may hold, we first must assess what is selling now, who is selling now, and what potential inventory lurks on the horizon, and intermix that with current economic conditions. As you can see from the attached chart, distressed sales accounted for 86% of the Lehigh Acres resale market, 71% of the Cape Coral market, and 66% of the Fort Myers market. These sales all occurred in the last 3 months. Distressed sales have actually fallen in Lehigh Acres and Cape Coral, and have risen about 4% in Fort Myers. To answer the Who is selling, the answer quite simply is banks who have foreclosed, and home sellers who owe more than what the property is worth, and with the assistance of their lenders by agreeing to a short sale. Banks don’t always agree to a short sale unless the borrower has significant financial hardship, and even then these deals are tenuous at best. In answer to what is selling, primarily the foreclosures have been entry level homes at bargain basement prices. We have recently seen some higher priced foreclosures, and we think more are in the pipeline. We have also seen some intermediate and slightly higher priced short sales selling, with a trend also to higher priced properties of late. Let’s turn to what is Not selling. Many sellers cannot afford to sell due to depressed property prices, but they do not qualify for a short sale because they don’t have the necessary hardship to qualify. Other sellers cannot sell right now because they would not qualify for a new mortgage under current underwriting guidelines, so it’s best just to stay in their existing home and ride out the market. This leads us to the reality that we also have pent-up supply. Due to record sales, our listed inventory has steadily been going down; however I think there is a lot more inventory that could be on the market if prices were higher. Because prices are low, many sellers who don’t need to sell won’t and will wait out the market. The only downfall with this strategy is that whatever these sellers would like to purchase to replace their existing home is also low right now, but will go up with the market. Sellers waiting for higher prices to replace their existing home will be paying a higher price for the home they purchase, negating any financial gain by trying to take advantage of bargains today. Sellers today are in a no-win situation, unless they’ve owned their home for a significant time or put a lot down when they purchased. If you’re going to trade up you have to do it within the current market. As the market goes up and down, so does what you are selling, and what you are buying. There really isn’t a great way to time the market, unless you have the wherewithal to buy a bargain home now and either rent out the new home or your existing home, then sell one when prices are better. Everyone wants to know when prices will return to what they were at the height of the market. The answer is they may never return to the frenzied level that wasn’t sustainable. If inflation returns like some think it will, tangible assets like gold and real estate typically do well. However, if inflation returns, those price gains may be down the road because inflation in the short term can stifle home sales. The other wildcards are the job market, the overall health of the economy, and the biggie might also be pent-up supply. How much pent-up supply is out there? Nobody really knows, just as it was hard to know how many of the pre-construction homes were actually sold to speculators who said on their loan applications they were primary borrowers. These so called speculators would later lead to foreclosures and the mess we are in today. The builders may have had an idea when one person was buying seven homes, but there was no way to tell with all the people buying just one home back in the run-up. The real test will be when everyone who wants to sell feels like they can, and what the supply and demand factors are at that time. Until then we have an artificial market, and any time you have an artificial market, artificial economic rules apply. This market is a lot like the Price it Right Game show. You don’t know what’s behind each door, and the only rule that applies is you must price it right to sell. We’ve been researching and studying the SW Florida real estate market ahead of official releases due out next week, and our preliminary research tells us we expect sales numbers to increase approximately 100% or more over last August sales numbers. The third quarter of 2009 is setting up to be another record quarter, and keep in mind 2008 numbers were near record numbers to begin with. 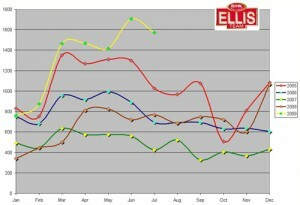 Lee County single family inventory levels are on the decline again and pending sales are remaining strong. 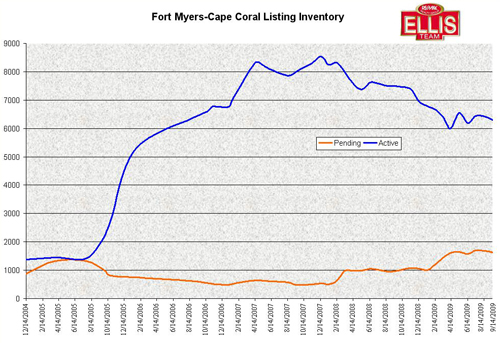 The chart attached shows single family home inventory for Fort Myers and Cape Coral Florida. Listings in Fort Myers and Cape Coral fell by over 100 units as home buyers snapped up more property last month than came to the market. Separately, Lee County levels fell almost 200 units, suggesting buyers are buying faster than sellers and banks are bringing property to the market. In the last several weeks we’ve addressed who is buying these properties, predominantly first time home buyers and long-term investors seeking to rent them out until the market improves. At today’s low prices, properties actually cash flow, and we have lots of renters who have been displaced from properties. Now for some interesting observations we’re noticing that you won’t see in this chart. We think home sales will be down about 11% from the previous month, which is normal due to seasonality. Again, sales should be up about 100% over last year’s August, and last year’s August was down from July as well due to seasonality of the market, so no big surprises here. Foreclosure inventory increased 4.14% in the past month and foreclosure sales fell 13.82% We’ve been saying for the past month or so banks are ramping up foreclosures for the next year and we expect double the write-downs banks will take, although because many of these properties will be in the higher price ranges it doesn’t mean we’ll see a doubling of foreclosure inventory. Foreclosure inventory and sales will definitely be something we want to keep an eye on going forward and may tell the story of how our market is doing. 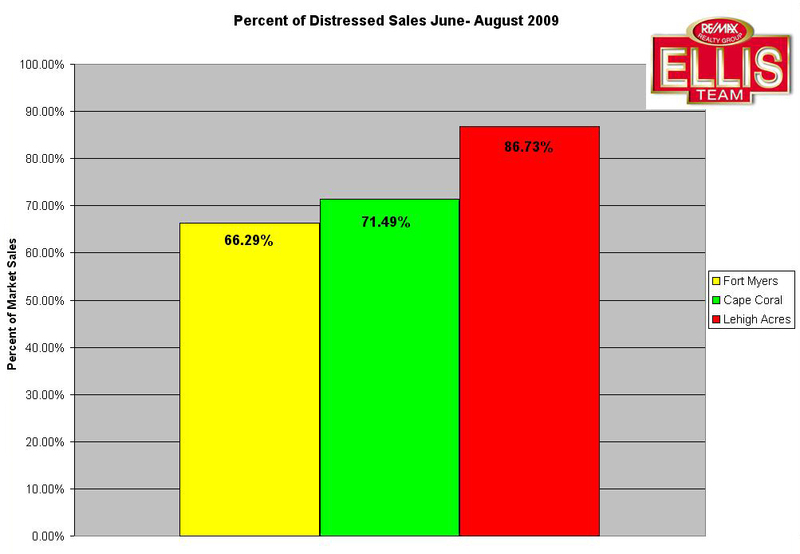 Distressed sales accounted for 70.04% of Lee County home sales in August, up slightly from 68.6% in July. Distressed sales are here to stay for awhile. In Fort Myers, 66.45% of the sales were distressed, while in Cape Coral the number is 68.87% Lehigh Acres has far more distressed sales at 84.27% County wide, distressed sales percentage remained stable over the previous month. Inventory levels fell in Fort Myers, remained fairly constant in Cape Coral, and increased about 2.35% in Lehigh Acres. So what’s the bottom line? We believe median prices may increase some over time as banks bring higher priced foreclosures to the market. Banks allowing more short sales may also increase the median sales price, but that doesn’t mean all homes are going up in value. If this occurs like we think, it simply would mean the bottom has formed in the lower price range, and we’re still seeing erosion in prices in the mid to upper price ranges, and as they become more affordable buyers switch “on” and buy them. All real estate is local, and you can’t judge the entire market by a single statistic like median sales price. This is why we take so much time to really study the market and explain what is really happening with hard facts. We’ll keep an eye on the distressed end of the market, as these latest trends will offer us signs as to where the market actually is and where it’s headed. Until we flush out the distressed properties, normal market assumptions do not apply. Supply and demand still rules, it’s just that it’s hard to get a grasp on supply without having a thorough understanding of what the banks are doing with foreclosures and short sales. Until then we’ll keep tracking it for you and reporting the trends. Official real estate sales numbers were recently released so we decided to take a look at how the Fort Myers/Cape Coral market fared against the top markets in the state. Cape Coral/Fort Myers is considered a metropolitan statistical area (MSAs) Our MSA includes Bonita Springs, Estero and all of Lee County Florida. Let’s start off with the bad news and get that out of the way, which will lead us to the good news. 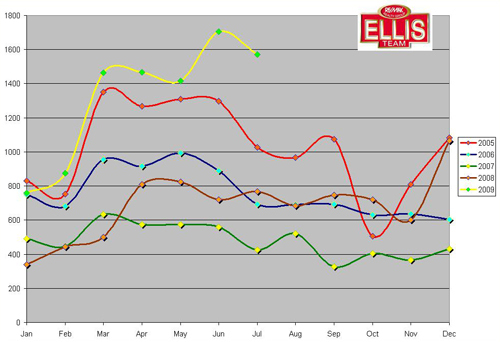 The bad news is the Cape Coral/Fort Myers MSA led the state in median sales price decline year over year for July. Lee County was down 43% to $89,000 in July 2009, down from $154,900 in July of 2008. This isn’t new news as we’ve led the state all year as SW Florida was perhaps the most over supplied market in the state for single family homes. This leads us to the good news. Our area also leads the state in sales increases in transactions. 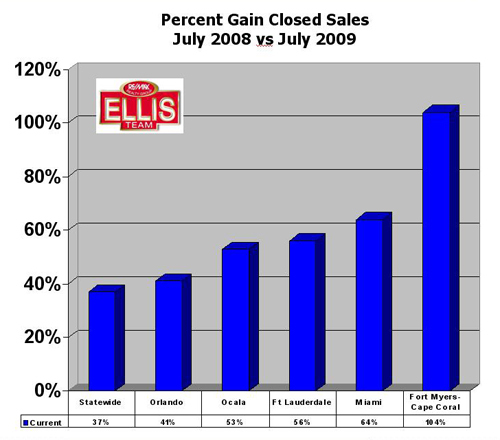 Because SW Florida was quicker to react than other markets, we were quicker to post sales gains. The Cape Coral and Lehigh Acres areas have been the focus of news reports on NBC Nightly News, the Today Show, Wall Street Journal, and many other worldwide media outlets which has led to an awareness of the bargains available in SW Florida. You’ve heard the old saying, “Even bad press is good press.” Well, it’s certainly true as Lee County has drawn the attention of northerners, Canadians, Europeans and Germans among others looking to buy a piece of paradise at a decent price. While we have seen many northerners buying second homes in our area, most of the single family home sales have been first time home buyers and investors. My friend Jeff Tumbarello with the SW Florida Real Estate Investors Association recently did a study and found recent sales were 64% cash buyers, which is an indication investors have found SW Florida and realize it is a bargain. Cash buyers can also be a sign that the new government appraisal rules are not working and are limiting many home sales. The new program is called HVCC and stands for Home Valuation Code of Conduct. This new program creates a middle man and increases costs to borrowers, and it prohibits communication from loan officers and appraisers. At first glance this may sound good, but in reality it has increased pressure on appraisers to turn around appraisals quickly, while at the same time slowing down appraisals getting to the lender. Imagine that, a government program increasing costs, increasing pressure and slowing things down. The worse news is buyers are shopping these bargains, finding them, making offers and applying for financing only to be told that an out of area appraiser doesn’t think these homes are worth it. The buyer wants to buy, and the seller wants to sell, but neither can, so it goes back on the market and is sold to a cash buyer for less because regular buyers can’t get financing. Many of the foreclosures go to cash buyers because bank asset managers know it’s tough to get financing buyers through due to appraisal issues. Fannie Mae and Freddie Mac back most of the loans other than government FHA and VA loans, and both have adopted the HVCC which was put together by regulator Federal Housing Finance Agency (FHFA), so we’re stuck with appraisal rules whether they’re good or not. We can blame our government for keeping home prices artificially low and preventing many qualified buyers from purchasing a home they wish to buy. I’m sure there are some good aspects to the rules, but the reality of the results is wrecking the market and changes should be adopted quickly. Rules should not dictate market value, the market should. These new rules will actually fuel further foreclosures from sellers who cannot sell. The statewide average of home sale growth was 37%, and you can see Fort Myers/Cape Coral blew that average away at 104% The next closest was Miami at 64%. As you can see, many metro areas are experiencing home sale growth which is encouraging, and this growth would have been much better both here and statewide if the appraisal issues were corrected. We expect foreclosures to increase this year over last year. The good news is buyers have absorbed all the foreclosures and eaten into existing inventory. The sooner we fix the appraisal mess the government created, and complete the foreclosure cycle, the sooner our market will be back to normal. In the meantime, enjoy the higher sales volume and the bargains as our market heals itself.